If you’ve used Circuit Playground before, the Arduino software is already installed on your system. If not, please read Circuit Playground Lesson #0 for guidance on downloading and installing the software and getting your computer talking to Circuit Playground. Before continuing, you should know how to upload a sketch (such as the example “Blink” sketch) to the Circuit Playground board. Read through the getting-started guides (such as the one linked above) if this is unfamiliar territory. Next, download the Processing IDE from the Processing web site. Processing is a programming language for Windows, Mac and Linux with audiovisual applications in mind. The first section of the Getting Started page explains how to install the software. The other files and folders in the ZIP file can be ignored. These are for other projects and aren’t essential to its use. Launch the Arduino IDE. From the File menu, select Sketchbook, which should “roll over” to show LEDstream_CircuitPlayground. Select this. From the Tools menu, select Board, then Adafruit Circuit Playground. If this option is not present in the Board menu, the Circuit Playground software is not correctly installed. Please review the previously-mentiouned tutorials to get this started. From the Tools menu again, select Serial Port, and then the port corresponding to your Circuit Playground board. Launch the Processing IDE. After a moment, you should see a blue and white window that looks similar to the Arduino IDE, but darker. From the File menu, select Sketchbook. This pops out a new window, which you should be able to scroll through and find the “Adalight_CircuitPlayground” sketch (if it’s not there, review the installation steps above), then open it. You can try running it just as-is, but it likely won’t work…you’ll either get a small preview window (that”s a promising start), or it might just completely crash if there are no serial devices attached. You need to edit the code first to point to the correct serial device number. When the program first starts, it prints out the names of serial devices, starting from #0. If you stop the program very quickly, you can scroll up in the console to see this list…count up from zero until you find the serial port corresponding to the Circuit Playground device (it’ll be the same serial port name you selected in the Arduino IDE). Then run again. If it’s not working, check your counting and try again. 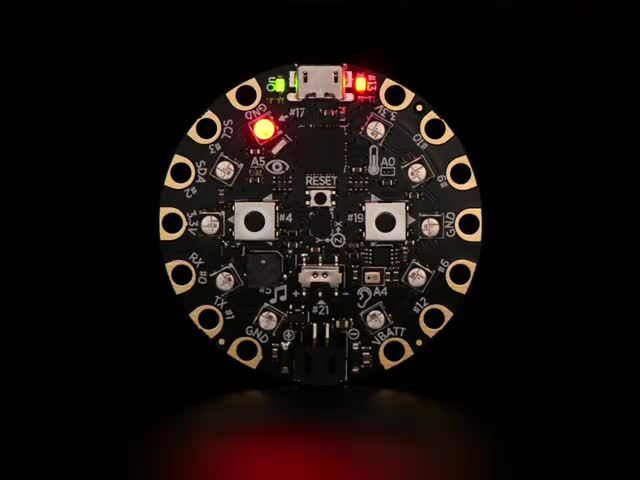 When it works, you should see the NeoPixels on the Circuit Playground board light up. This guide was first published on Jan 12, 2017. It was last updated on Jan 12, 2017. This page (Download & Install) was last updated on Apr 21, 2019.